Previously it was considered the second largest subspecies, behind the Siberian tiger (Panthera tigris altaica), however a recent study suggest that in the actuality this could be the largest one. The total length for the Bengal tiger males is of 270-310 cm meanwhile those of the Bengal tiger females is of 240-265 cm; the tail measure 85-110 cm of long and the height at the shoulders is of 90-110 cm. The average weight is of 221.2 kg (487.7 lb.) for the males and 139.7 kg (308 lb.) for the females, however those who inhabit the north of India and Nepal have an average weight of 235 kg (518 lb.) for the males and 140 kg (308.6 lb.) for the females. Officially, the heaviest Bengal tiger with confirmed weight was a male of 258.6 kg (570 lbs) and was shot in Northern India in 1938; however, the heaviest male captured by a scientist at this time is a male of 270 kg (595 lb), tagged in Nepal in 1984. The largest Bengal tiger, measured between pegs, was a male hunted by Archibald Dunbar Brander, which measured 221 cm of head and body length, 150 cm of chest girth, a shoulder height of 109 cm and a tail of just 81 cm, maybe cut off by a rival male. This specimen couldn’t been weighed, but it was calculate in no less than 270 kg. Finally, according with the Guinness Book of Records, the heaviest Bengal tiger know was a huge male hunted in 1967, it measure 322 cm in total length between pegs (338 cm over curves) and weighed 388.7 kg (857 lb.). This specimen was hunted in the north of India by David Hasinger and is actually in exhibition in the Smithsonian Institution, at the Mammals Hall. 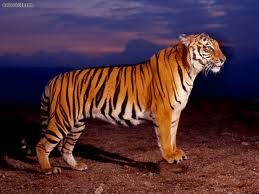 In the beginning of the 20 century, there was reports of big Bengal tiger males measuring about 360 cm. in total length, however there was not scientific corroboration in the field and it’s probable that this measurements were taken over the curves of the body. They are able to stay out in cold weather, because their skin is able to handle the temperature all over in any kind of weather. Its coat is yellow to light orange, and the stripes range from dark brown to black; the belly is white, and the tail is white with black rings. A mutation of the Bengal subspecies — white tigers — have dark brown or reddish brown stripes on a white background color, and some are wholly white. Black tigers have tawny, yellow or white stripes on a black background color. The skin of a black tiger, recovered from smugglers, measured 259 cm and was displayed at the National Museum of Natural History, New Delhi. The existence of black tigers without stripes has been reported but not substantiated. The Bengal tiger's roar can be heard for up to three miles away.